A vivid representative of the “pink period” of the work of the Spanish artist Pablo Picasso is the painting “A Boy with a Tube”. At the time of writing this canvas, the genius of the brush was only 24 years old; He wrote it on Monmarthe, in the Bato-Lavoir hostel in 1905. In the picture you can see an unknown man-boy, who is holding the phone in his left hand, and on his head is wearing a crown of large bright roses. The “Boy with a Pipe” portrait has long been a special, major work in the collection of the famous collector of America – J. Whitney. In the near 2004, the image of an unknown child was auctioned off at Sotheby’s for $ 104 million. The starting price of 70 million dollars was already unprecedented for the art market. How high the cost is understandable. First of all, the provenance of the portrait was impeccable. 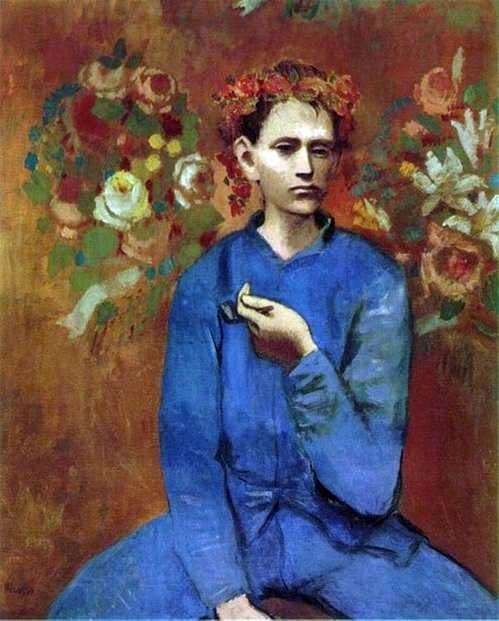 Secondly, the picture “A boy with a pipe” is unique – the works of the early Pablo Picasso are very rarely found on the market; almost all representatives of his “pink” and “blue” periods belong to museum exhibits. Such a price at that moment was a record, overtaking the price that had been held for 15 years on a painting by the Dutch master Van Gogh entitled “Portrait of Dr. Gachet”. The record of the sum for “The boy with a pipe” kept 6 years, till 2010. In the choice of colors, the master preferred pink-golden, pink-gray tones; The blue suit on a child is a symbol of the pain and detachment of this person from the whole world. Interesting circumstances of writing a masterpiece of Picasso. He was a representative of the Parisian Bohemia, the most prominent representatives of which were Guillaume Appolinaire, artist Georges Braque, Amadeo Modigliani, Henri Matisse. But on the other hand, he lived in a very poor quarter, communicating with local people, completely impoverished and lost people. In the circle of his friends included prostitutes, roving artists, street vendors. The portrait “A boy with a pipe” depicts a little Louis, a street boy who became a friend of the great Spanish artist. The child often watched the work of the master, and over time he himself became a character in his canvases. Not surprisingly, this mysterious work is listed in the Guinness Book of Records as one of the most expensive paintings. The result of the “pink period” of the great Picasso “The Boy with the Pipe” surely took the fifth position in this list. The portrait “A boy with a pipe” depicts a little Louis, a street boy who became a friend of the great Spanish artist. The child often watched the work of the master, and over time he himself became a character in his canvases. Not surprisingly, this mysterious work is listed in the Guinness Book of Records as one of the most expensive paintings. The result of the “pink period” of the great Picasso “The Boy with the Pipe” surely took the fifth position in this list. The portrait “A boy with a pipe” depicts a little Louis, a street boy who became a friend of the great Spanish artist. The child often watched the work of the master, and over time he himself became a character in his canvases. Not surprisingly, this mysterious work is listed in the Guinness Book of Records as one of the most expensive paintings. The result of the “pink period” of the great Picasso “The Boy with the Pipe” surely took the fifth position in this list.